A new business class design introduced this week by Qatar Airways uses movable privacy panels to create double beds or even four-person suites- and it will hit the skies this summer. 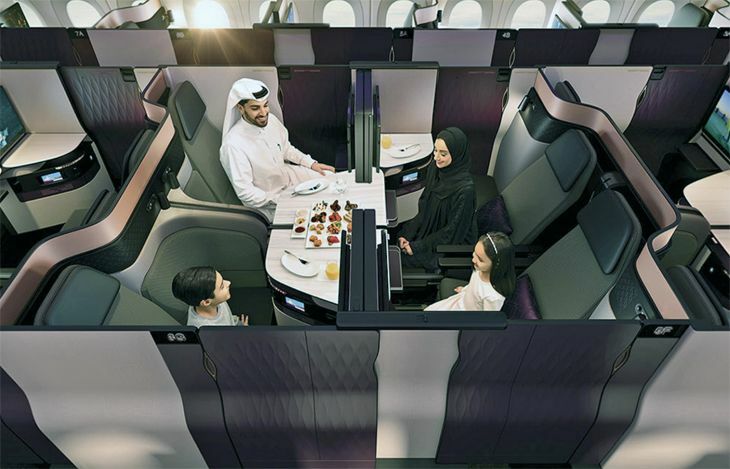 The new 42-seat “QSuite” cabin will first appear on a Qatar 777 between Doha and London Heathrow in June. It will also be going into all the carrier’s other 777s, and will be installed on Qatar’s new Airbus A350-1000s. Currently, round trip business class fares on London-Doha route in July are running about $5,274.00. Qatar is a member of the Oneworld Alliance. 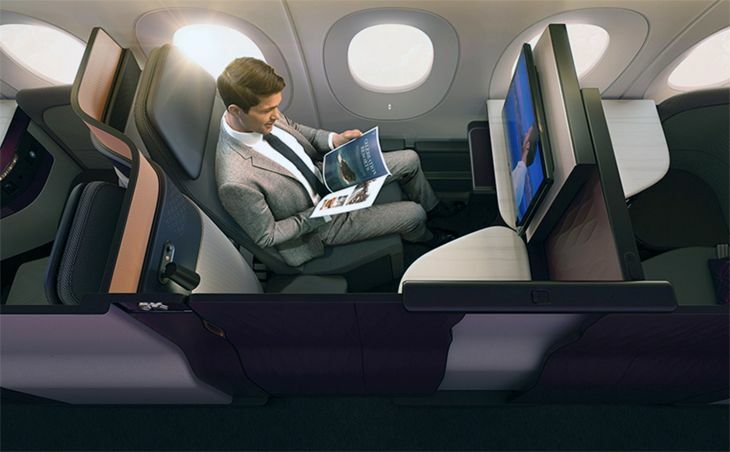 If you ever wonder why international first class cabins are gradually disappearing from the skies, you only need to see the innovations in luxury and amenities that are coming to international business class these days. In many cases, layering first class on top of them would truly be gilding the lily. 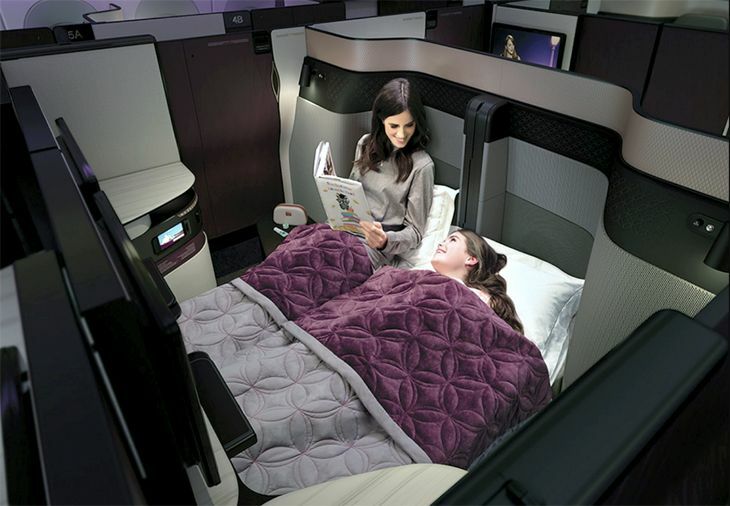 Case in point: The new QSuite business cabin introduced at a Berlin trade show this week by Qatar Airways. The keys to the creative configurations possible in QSuite are stowable privacy panels and movable video monitors. Two persons seated next to each other can deploy the privacy panels to create a private room with a double bed. And four seats in the center of the cabin can be walled off together to create a four-person suite for business meetings, socializing and/or dining together. 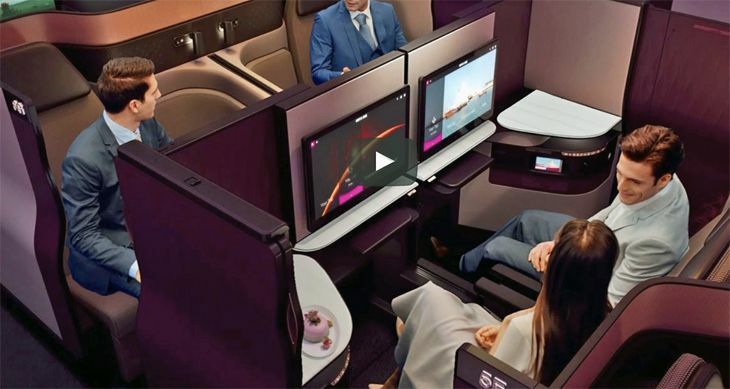 “These new features provide the ultimate customizable travel experience that enables passengers to create an environment that suits their own unique needs,” Qatar said. The QSuite food and beverage service has also been upgraded; in addition to new cuisine options served at the time of the passenger’s choice, the airline will also provide “sharing dishes” any time during the flight, so passenger can partake together. Qatar also is offering an express breakfast service for those who want to sleep late. Also coming are new business class “sleeper suits” and amenity kits from top international designers. And the airline announced that it will be deploying “best-in-class” Wi-Fi connectivity sometime this summer. So what do you think? Would you fly Qatar to experience business class like this? 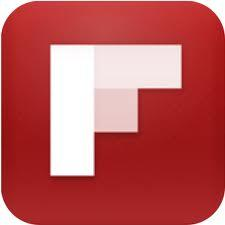 Or would you stick to something more tried and true? Please leave your comments below.